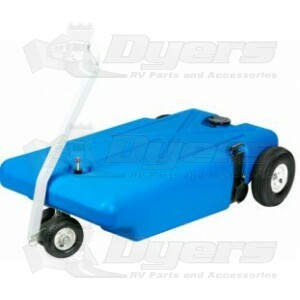 Works great, easy to pull by hand, easy to drain,just pull up to the sump and pull the the T handle No tipping needed. Just got home from the Iowa state fair and used it for the first time,should of had one long ago. Only one problem there is no vent so when you drain the trailer you must unscrew the float as to get it to take on the water other than that well pleased. Serves a great purpose... wish it had built in storage for accessories... heavy duty wheels, maneuvers easily.